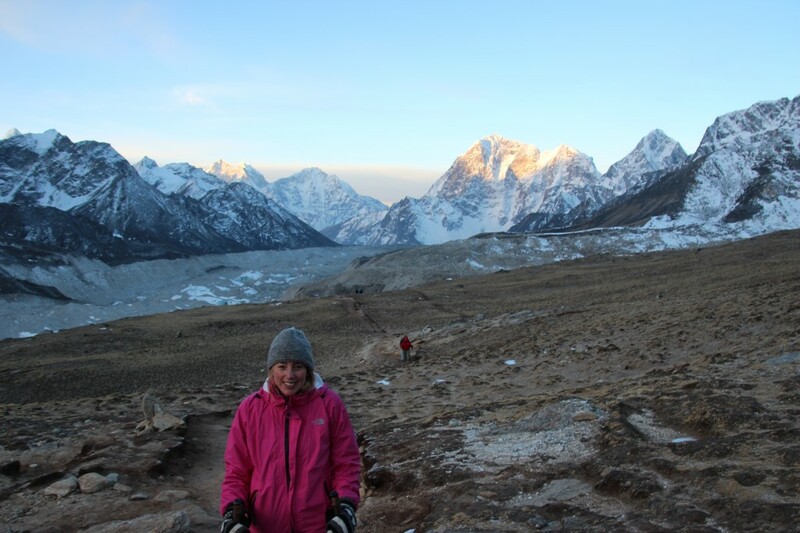 Jenny: Day 10: Namche Bazaar (3445m) to Debuche(3800m). 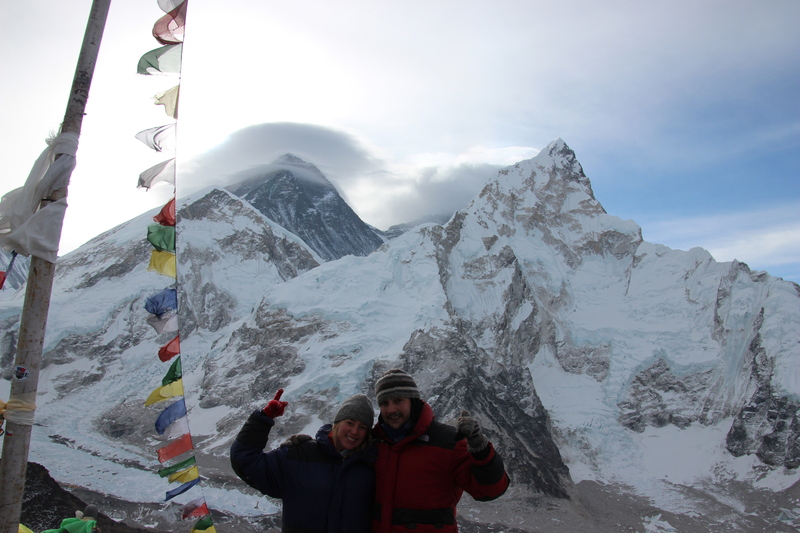 I still can’t quite believe it, but today we were finally successful and caught our first view of Everest! 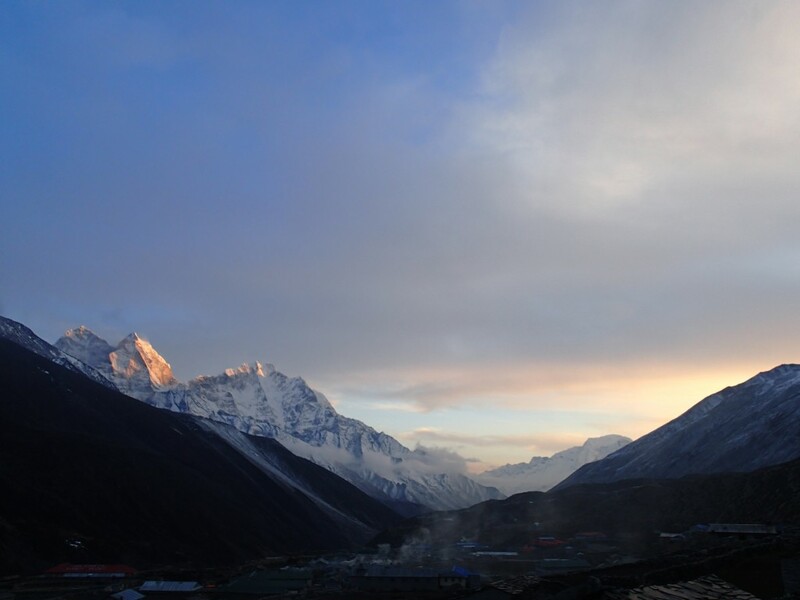 We had set off early from Namche in a bid to catch the elusive sight whilst the clouds were still at bay, and a light covering of snow over the town set the scene beautifully as we rounded the corner and suddenly saw Everest there before us. It was more than surreal to at last be seeing it with our own eyes – the top of the world, not an earthly thing higher. We spent a few minutes in rapt awe gazing at the peak and taking (more than) a few snaps, before we pulled ourselves together and realised that we would see an even better view of the mountain over the next few days, so we might as well get moving (stopping was chilly). 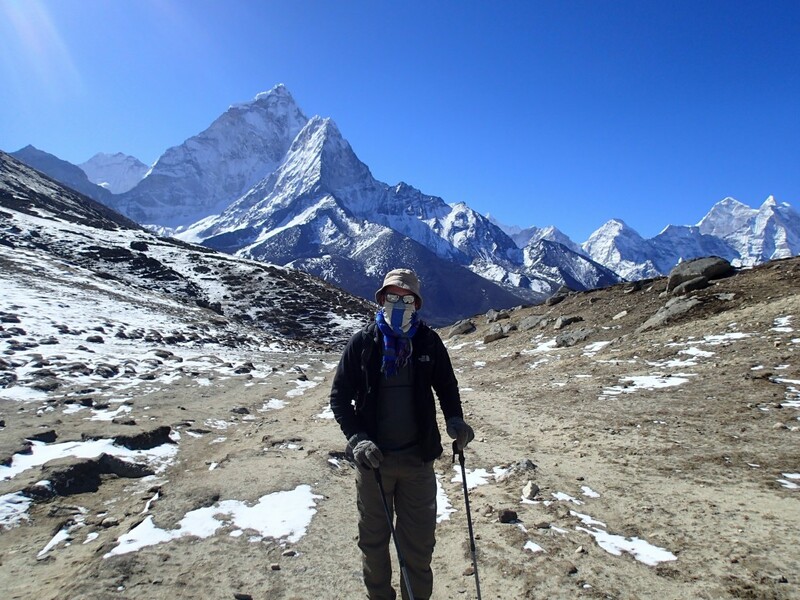 The first couple of hours walking were gentle and stunning – we were high above the valley floor but surrounded by snowcapped giants the whole time. The inclines, however, were getting tough as we were getting higher. Even the smallest of hills had us gasping for breath as the air got thinner. 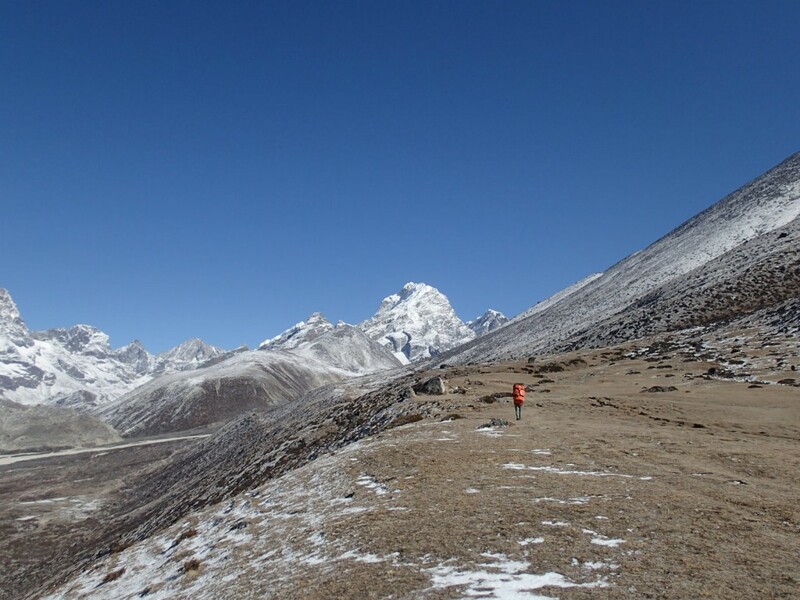 The final hour and a half push up to Tangboche felt like a real killer. Unfortunately our guesthouse was not in Tangboche but another half an hour or so down a muddy hill; also unfortunately it was a blooming freezing building of paper thin walls and not much else. The water tap in the bathroom sink actually had icicles coming out of it rather than running water. After a filling lunch of Dal Baht we headed back out for our second walk of the day. Now that we are pushing the higher altitudes it is not enough to merely arrive at our destination for the night – we now have to get there, walk uphill for a few hundred metres, and then back down again. Apparently it all helps, so in an effort to ward off altitude sickness we do whatever Dharma says (even though his favourite catch phrases are ‘easy peasy lemon squeezy’ and ‘don’t worry chicken curry’). After our acclimatisation walk we ended up back in Tangboche in time to see the monks praying in the monastery. 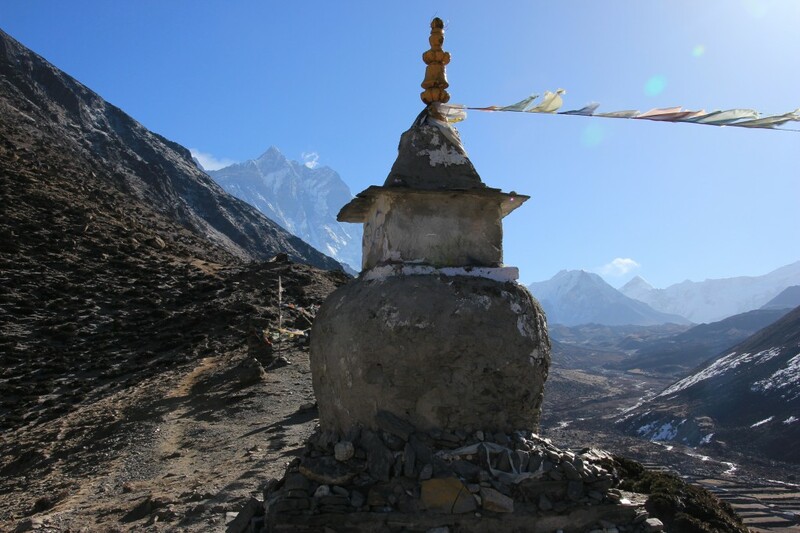 After so much walking the relaxing drone of their chants nearly sent me to sleep, and probably would have done had it not been for the pungent stench of 30 trekkers’ unsheathed feet (ours included) – we all had to leave our boots at the door. UP at altitude we don’t actually walk for all that long each day which is great news because each and every step is hard work. 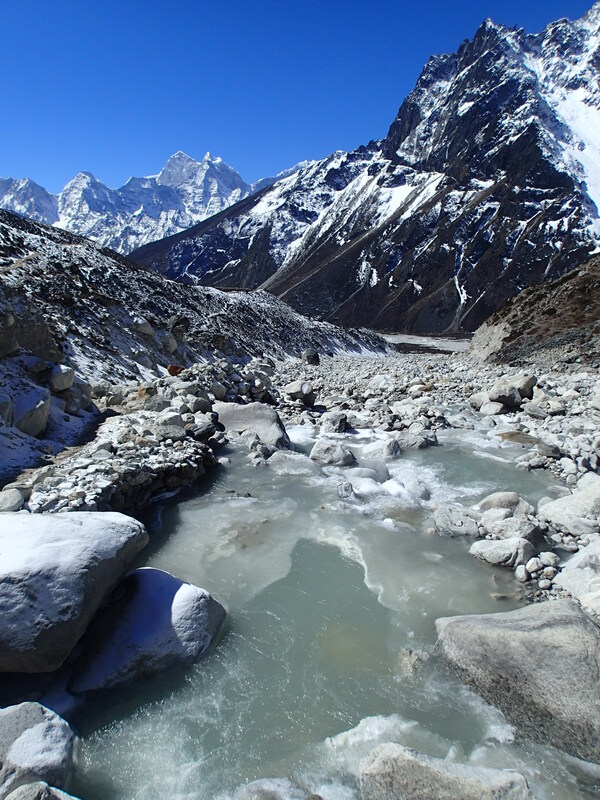 Today was a lovely day walking alongside the river with an early sight of Everest before Ama Dablam took centre stage. 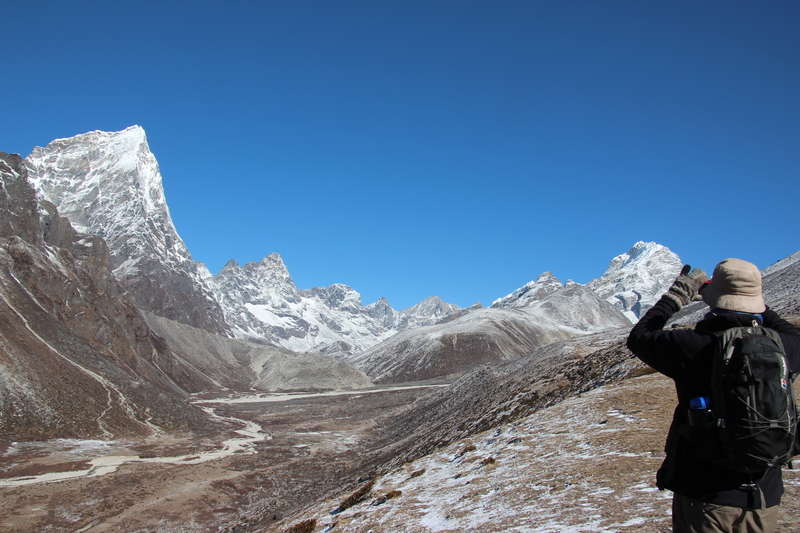 A truly magnificent mountain with twin peaks that dominate one side of the valley next to Dingboche. Had an amazing sunset today after the snow storm passed through and then took some photos as the moon shone down on the snow-capped mountains. Really didn’t enjoy our acclimatisation hike this afternoon. We set off to incredibly clear views of the valley that had been covered by mist yesterday. It was slow going as with every step, even on the flat, we struggled for breath, but it gave us a chance to look around and take lots of pictures. We were surrounded on all sides by spectacular peaks. A much needed tea break was had before we struggled up a steep couple of hundred metres called the Tukla pass. We were rewarded for our pain by a beautiful blue sky, immense views and colourful Buddhist flags everywhere. From there it was a fairly gentle walk to Lobouche but by this point I was feeling rather lightheaded and it was all I could do to put one foot in front of the other and try to keep up with Nick’s conversation with a nice bloke called Will from Farnham. After arriving in Lobouche and our mandatory extra acclimatisation walk (at which everyone else laughed at us because they weren’t being made to do one) we were able to relax with the friendly crowd at the guesthouse and have a riotous (as you can get at 6.30pm) game of dice with brothers Zaid and Raad. Zaid and Raad think it is hilarious that not only have we walked in all the way from Jiri, but we also plan on walking back rather than getting the plane from Lukla. They laugh uproariously every now and again at the thought. 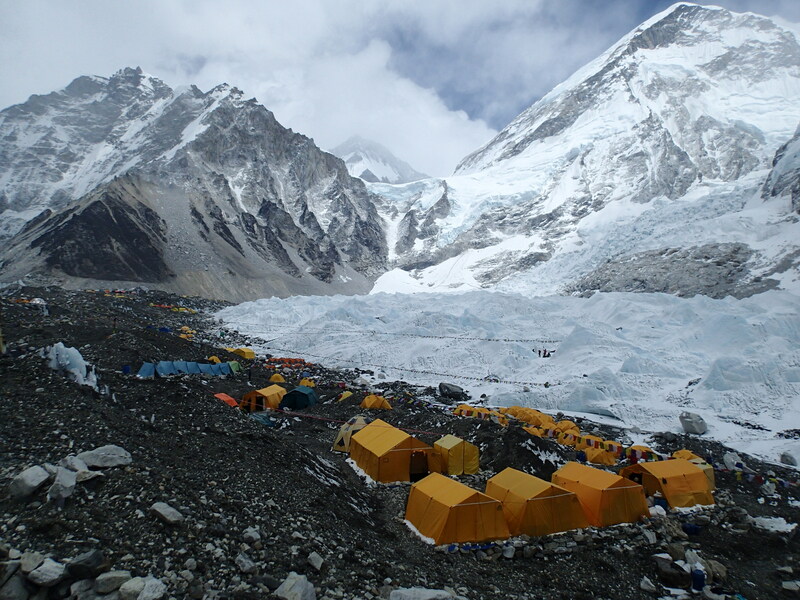 So today we hit our target and made it to Everest Base Camp which is probably the most inhospitable place to set up camp. A rock and pebble surface between Mount Everest on one side and a huge loose rock mountain on the other. Those hoping to summit often spend 40 or 50 days at Base Camp or in the surrounds and that sounds terrible. The walk to Base Camp itself would have been pretty easy if it wasn’t for the horrible quality of the route that we had to take. Rocks, boulders and skree were our road and made you concentrate for every single step. It was pretty awesome to actually make it and reach the headline goal that we set ourselves. It’s been a tough old way from Jiri and we certainly felt a little special knowing that we had walked in on the same route as Hilary 61 years ago. 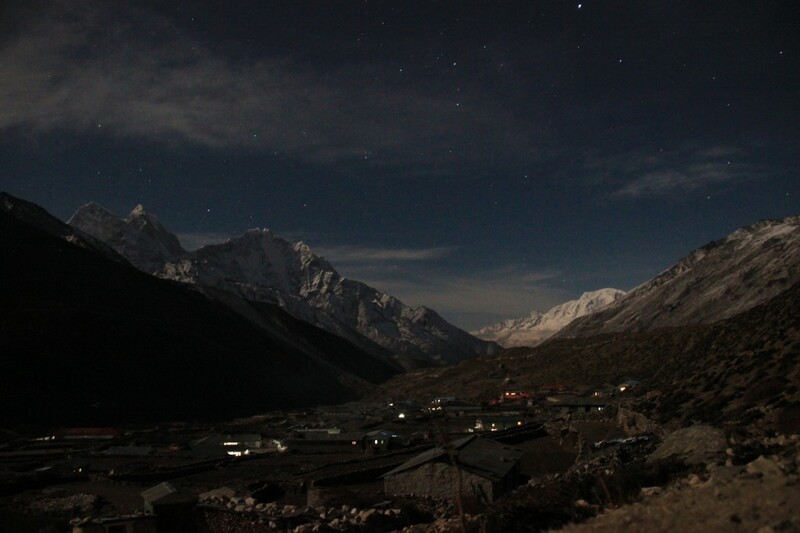 A few tears welled in my eyes as we walked back towards Gorak Shep where we would be staying that night. Remembering why we were doing this and everything that has happened in the last few years brought a lot of emotions to the fore and made the walk even more difficult! Tomorrow we take on Kala Pattar nice and early. An incredibly long day – our biggest challenge yet! Suffice to say a 4.45am alarm is never pleasant but in high and snowy conditions it is most definitely more than crap. 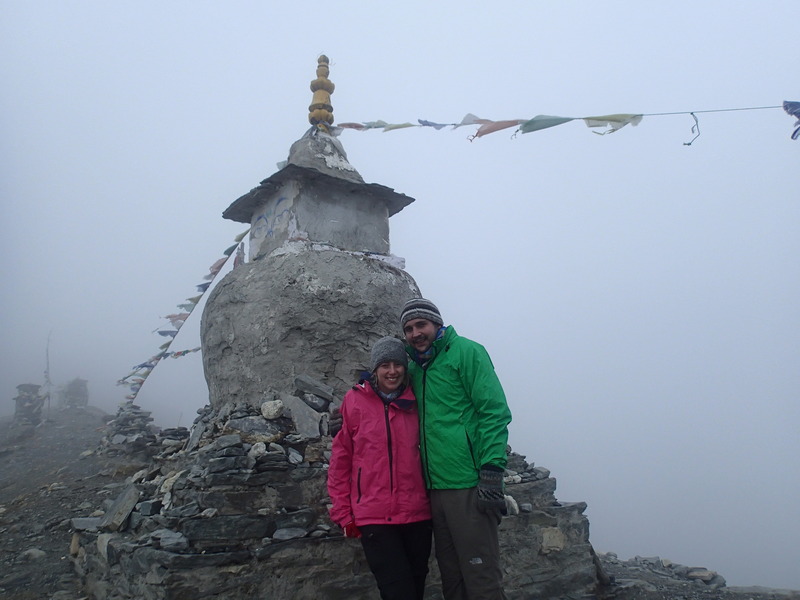 Nevertheless we hauled ourselves up and with half a snickers for breakfast set off on the walk up Kala Pattar just after 5am. We quickly realised we were in for a tough one. The sandy path was so steep that I even slipped a few times going uphill! The going was slow and hard. The lack of oxygen had us breathing raggedly and left us dizzy. You could see people sitting on the side of the path gripping their heads and moaning! As we got closer to the peak – which deceptively kept announcing itself long before we actually came upon it – it suddenly got very, very cold. So cold that I almost had a panic attack when swapping my normal coat for my down jacket (the size of a sleeping bag and it was still freezing). It was so cold that the water froze in the drinking bottles, and one of our camera batteries froze dead (the other one went immediately into emergency mode). The peak itself is very rocky and we were pretty much climbing over big boulders whilst being buffeted by a bitter, bitter wind. This meant that we could only really spend a few short minutes at the very top before the temperature forced us back down again. Whilst there though, we gratefully accepted that the views made what was perhaps the hardest walk of our lives very, very worth it. 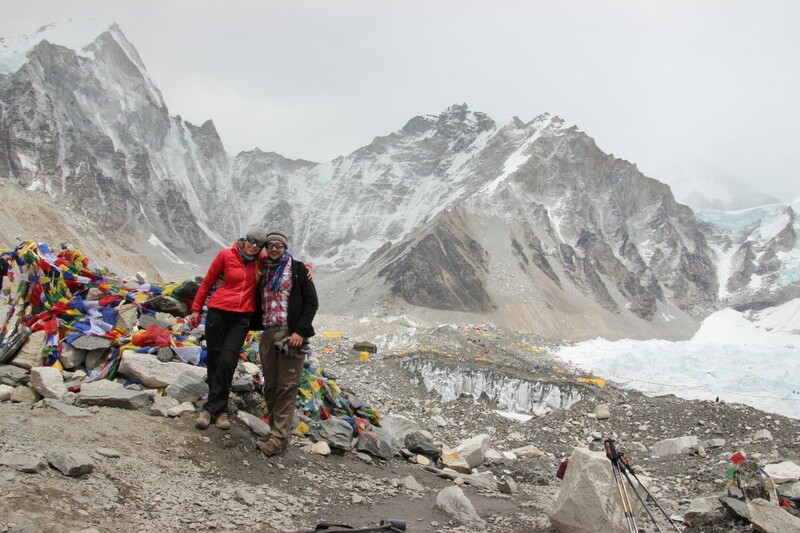 The top (which is considerably higher than base camp) gives an incredible view of Everest, as well as a 360 degree panorama of a multitude of Himalayan peaks. Going down was mercifully easier as it was at least heading in the right direction, but it was so steep and slippery that I still managed to deck it twice and cut open my knee – typical! Back at the guesthouse for 8.30am we tucked into a huge breakfast and then immediately felt too shattered to walk for another 6 hours. But haul ourselves up again we finally did and the way back was much more enjoyable as we were descending from altitude – the pounding headaches that had plagued all of us (including Dharma and our porter, Nima) gradually eased as we headed to lower ground. Alas, calamity struck as we were making our way through Periche and just as a snowy blizzard set in. Something in Nick’s leg twinged and all of a sudden it was well and truly buggered. Or at least, really horrendously painful to walk downhill on. Unluckily we had another hour or two of slow downhill to get through. Zaid and Raad passed us on the way and supplied Nick with a packet of horse-sized ibuprofen, and somehow we made it to Pangboche. Back to the promised land and a hot shower and a beer. It was a long hard painful slog today as we left the high altitude behind. My knee was making us go very slow down hills and unfortunately we have a lot of downs to contend with. Eventually we made it and as we were hobbling into Namche itself we bumped into Zaid and Raad and agreed to meet at the Irish Pub for a beer. Alas, Guinness was a whopping $10 so I made do with San Miguel whilst Jen had a small can of Everest beer as she was starting to feel a bit sick. We had our latest night for a long time after a couple of very relaxed hours with Zaid and Raad. We were still in bed by 10pm! 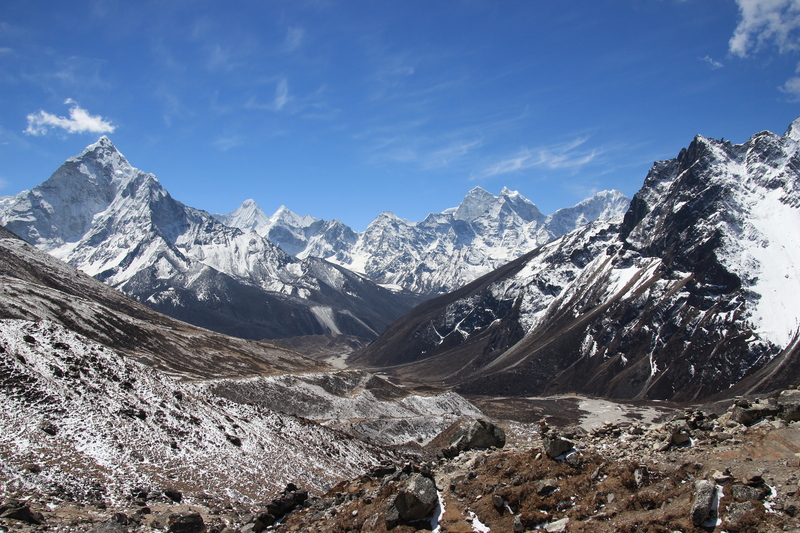 All of this was largely irrelevant because as we walked back from Pangboche we heard news that there had been a huge avalanche that affected 50 climbers. As we passed each village a short conversation would take place and a few more details would emerge. It was a horrible experience and shows just how dangerous these mountains are. 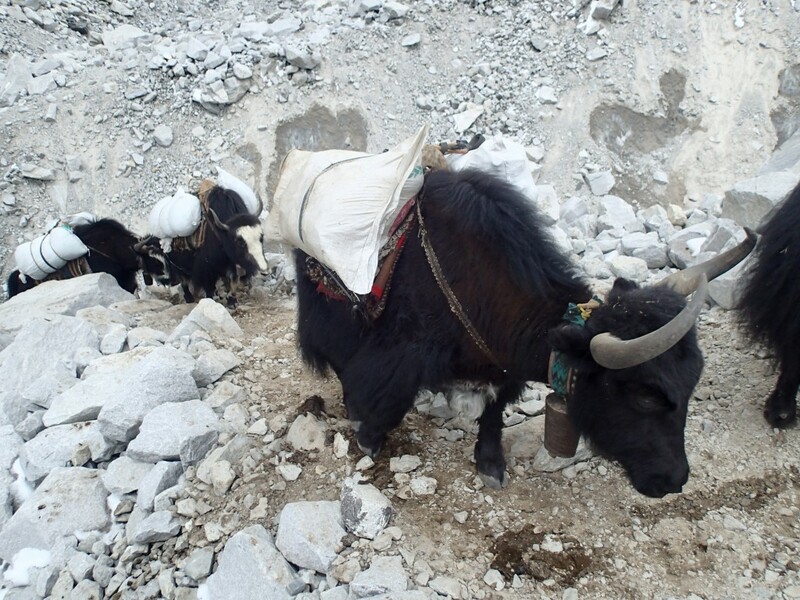 It also makes you question whether some of the more obnoxious climbers we have met actually deserve to have Sherpas risking their lives to make the climb possible. 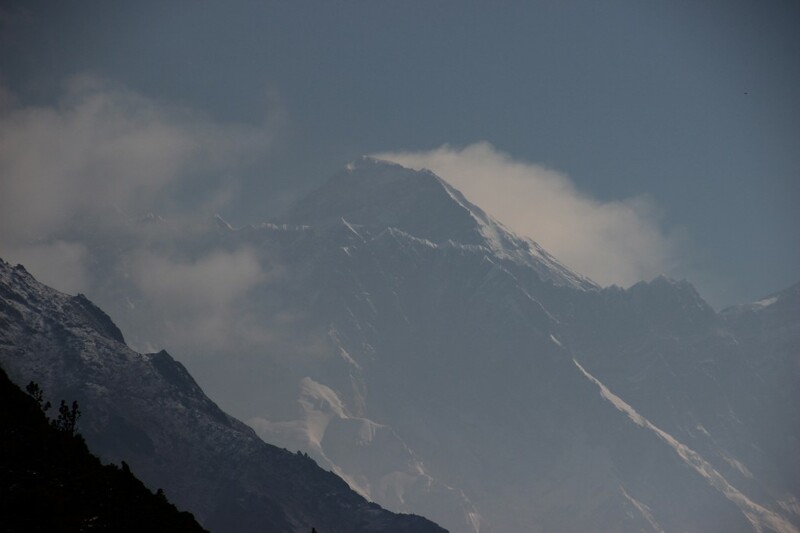 The latest we are hearing here is that 15 Sherpas have lost their lives in what is the worst avalanche in history on this mountain. 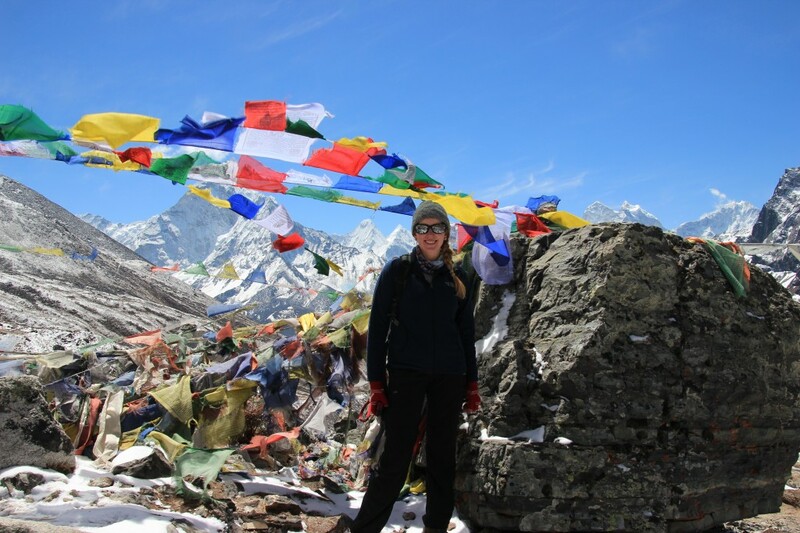 Jenny: Day 16… Namche Bazaar (3,500m) to Jorsalle (don’t know and don’t care right now). Today was pretty much a write off. This time last week we were looking forward to skipping our way down the big hill back from Namche, but instead we had a good old hobble. Nick was in great pain with his knee, and I was suffering from a different complaint – one of the stomach. 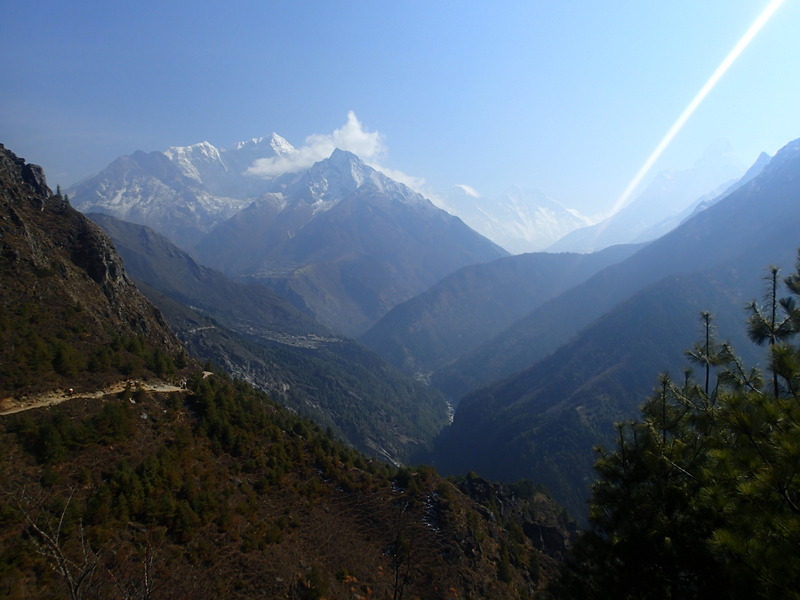 Within a couple of slow hours I was feeling so sick that we had to stop in the first village from Namche – Jorsalle – so that I could throw up and then progress to worse. There was nothing to do but get in to bed and sleep off the rest of the horrible afternoon. Another horrible day for Jen meant that we have had to change our plans. With effectively no food in Jen for the last 48 hours she is feeling really weak and has done brilliantly to make it to Phakding. This is one of the bigger villages with pretty comfortable teahouses. Dharma has been on the phone to the office and they want us to fly out of Lukla which is only a three hour walk away. It is incredibly tempting but we have come up with a compromise. There is no way we can make it to Jiri now but we can make it most of the way and stop at Phaplu before taking a jeep back to Kathmandu. It’s still a long old walk of 4 days but we are hoping Jen will feel better tomorrow after (fingers crossed) keeping down some food today. It’s Easter Sunday and in order to feel a bit more in the spirit we have bought ourselves a Dairy Milk chocolate bar. We hope you are all enjoying your chocolatey bank holiday weekend and can’t wait to see you all soon.